We started our new school year in August and had plenty of time to take things slowly, adding a few subjects at once until we were at a full course load. I just love this picture! TJ spent a weekend with friends before starting school on Tuesday. We're studying the Middle Ages, Renaissance & Reformation this year - using the Project Passport series from Home School in the Woods. I spent the week getting everything prepped so we'll be ready to go. I think it's going to be a great year of history! Another new-to-us program - Writing with Skill from Peace Hill Press. We started the first week of lessons - a review of summarizing excerpts and short stories. We're using a few different things for Logic study this year. To start our year we're using The Great Chocolate Caper - a fun mystery whodunit. Working on stretching the independence a little - I'm letting her take the occasional subject to her room as long as she stays on task and doesn't take too long. It's been a good week for us - we're finding our footing through these early adolescent years and (both of us!) are learning how to deal with emotions and more autonomy. Seems like you get one thing figured out and something new pops up, so we're enjoying this quiet calm while we can. It was only a 3-day week - so we packed it full. TJ's spending a few days visiting friends and having a 'pre-Thanksgiving' vacation. Monday is Thanksgiving here in Canada so it will be another 4-day week next week. Working on our Latin - Latin is one of the subjects that we do together - I even have my own workbook. This week we spread out all the flashcards and took turns saying the Latin words and their English meanings (without looking). TJ had more correct answers than I did. Art project with Art in History - we really like the projects from Art in History and have been choosing a few to do every year. We started the year with the end of the Roman Empire so TJ painted a Roman oil lamp. Watching our weekly documentary - on our "Fun Fridays" we watch documentaries and have been putting our subscription to Curiosity Stream to good use. There are lots of great docs to choose from. We watched a fascinating one about two lynx cubs this week. TJ is learning piano this year - she's done a bit of piano in the past, nothing formal. This year she's using Hoffman Academy lessons to work on her piano skills. It's been a few weeks since our last weekly wrap-up. We had a light school week followed by a week off for Thanksgiving and we're back to the books again this week. We have two more weeks of school before two weeks off for Christmas. I'm looking forward to the break! Snow day! We had our first snow last week and TJ got dressed to go play as soon as she saw it. The snow only stayed about a day before the rain washed it away. Bible and memory work - TJ has been reading a few verses every morning and choosing a portion of Scripture to memorize every term. Right now she is re-memorizing Psalm 23. Vikings - this week we studied Vikings - TJ read some books, worked on notebooking, added things to her timeline, and did some map work. Pointillism cookies - It's Georges Seurat's birthday this month so we did a pointillism project - painting on cookies. TJ decided that she would use her My Little Pony figures for inspiration. We've had a nice quiet school week. TJ's doing well in all her subjects. I'm especially impressed with her writing. She's had trouble summarizing - she tends to add way too much detail - but she's been doing better. We've set aside Writing with Skill 1 for awhile so she can work on the skills she's learned. The text is very thorough but a bit overwhelming for her so we're going to take it in smaller chunks. We've made it through week 16 so I think we're going to pause there and work on applying the skills to her history writing assignments. She asked about doing the next Writing & Rhetoric book - she really likes that series, so I think we'll grab that to work on for the rest of the year. She really prefers the interactive lessons and creative way the series is taught. Working on grammar with Rod & Staff - we've made it through the pronoun section (that was tough!) and have moved on to punctuation and capitalization, which is a nice break from those pronoun lessons. TJ discovered a Minecraft periodic table at the store - and had to snap a picture to send me. Latin unit review - it's time for a big Latin review before we tackle the last unit in First Form Latin. I will either be spending my summer break studying ahead or signing her up for an online class. Latin is tough. It's been a busy month here at The Sunny Patch! We've been moving right along through our textbooks and workbooks and can see the end of the year in sight. In a week or two TJ will have finished with vocabulary (Megawords), there's one more lesson left in Latin before final reviews, and we're continuing to move along at a good pace through math and grammar. We have about two more weeks of our Renaissance study then we'll finish out the year with a more in-depth study of explorers. I just pulled out a few TOPS books as well - so TJ can have some fun with planting and tracking seed and plant growth over the next few months (after we finish up history). Mapping the Reformation - we've been studying the Reformation and Counter-Reformation for the past few weeks - reading lots of books, discussing what happened, and mapping all the major players. More Science fun - we're still working our way through memorizing the periodic table. Every week we review one video and watch a new one (and recite all the elements that we've memorized). Learning about U.S. Elections - we had a great time making a lapbook all about the election process thanks to Home School in the Woods. Working on Math - TJ is just finishing up another year of Horizons and we are considering our options for the high school years. We've decided to give her another year to shore up all her math knowledge before tackling the upper-level math sequence. She'll be giving CTC math a try over the summer to see if that will be a good fit. 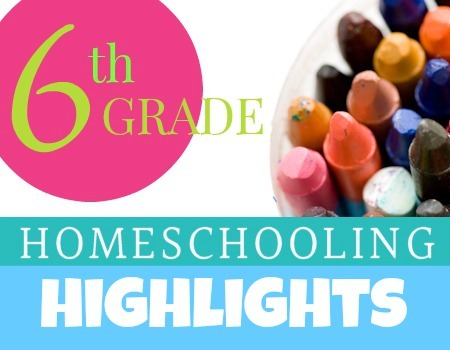 It's the end of the school year... and time to start planning 7th grade. We're not quite finished with school (we need to do 180 days and still have 15 to go) but have finished all of our planned assignments and textbooks - so we're doing a little extra history, reading, and math to finish out the official year. Then, during the summer, TJ will continue to work on math and have a daily reading time. Finishing the last section in Rod & Staff English - the only grammar course I've ever seen that has a lesson about using your Bible concordance and dictionary. Science in our last term - we used a TOPS science book to learn all about plants - TJ tracked radish growth for a month. Fun stuff! Nice weather means reading time is spent outdoors. We visited family in Maine (over a month ago now) and had fun visiting my sister's new baby goats.